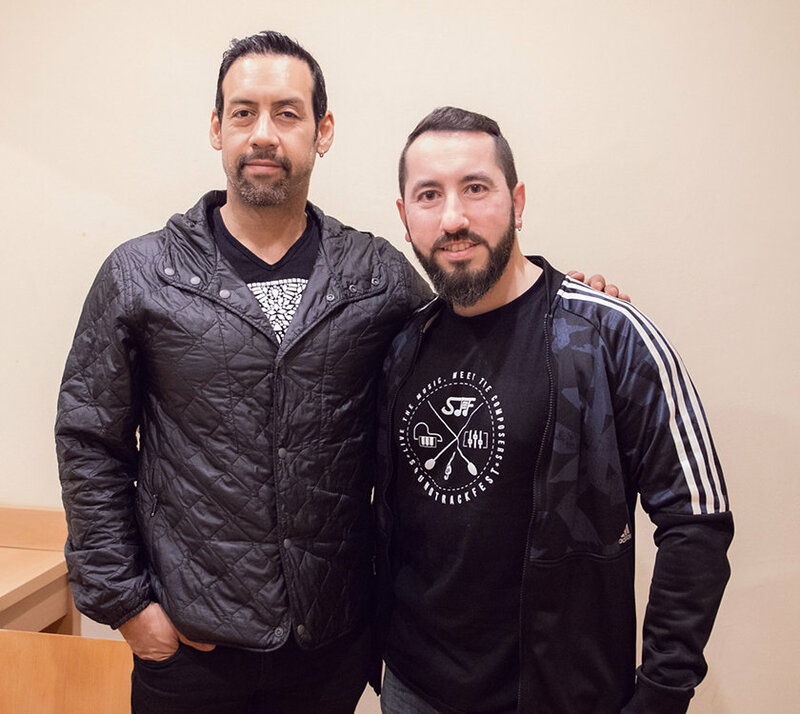 Last week the Mexican drummer Antonio Sanchez was at the Teatro Lope de Vega in Seville (Spain), and Rafa Melgar had the opportunity to attend his concert, as well as to interview him in an exclusive for SoundTrackFest. Here you have the summary of the concert and the interesting interview he conducted, where they talked about why Jazz musicians are attracted to compose for the movies, his latest album ‘Lines in the Sand’ and its meaning, and the show Birdman Live Scoring Event, which in a few months we will be able to enjoy at Krakow Film Music Festival. 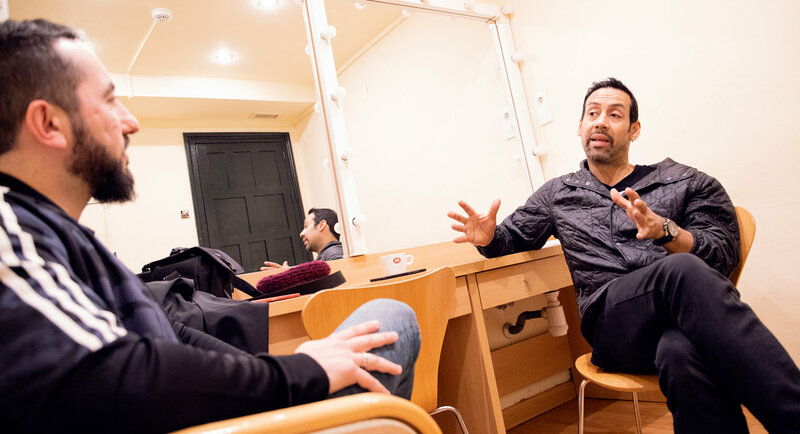 On January 15, 2019, Antonio Sanchez and his entire band arrived at the Teatro Lope de Vega in Seville (Spain), with approximately two hours of sleep due to a frantic travel rhythm. 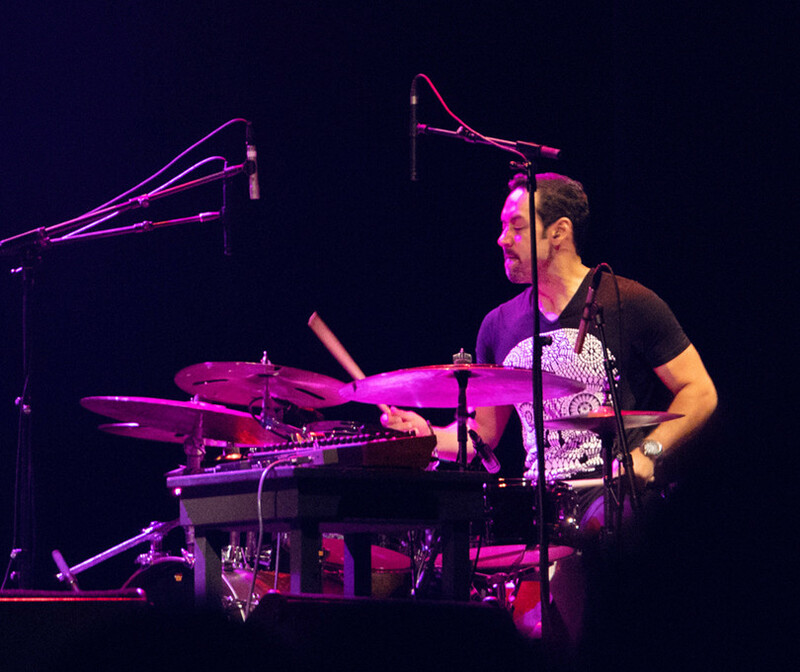 The Mexican composer was on a European tour to present his latest album “Lines in the sand”. 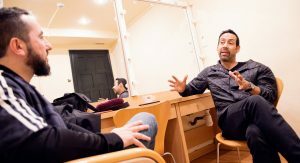 The concert started a few minutes late and I have to confess that it was my fault, as I was interviewing Sanchez in his dressing room of the theater. The good disposition and generosity of the composer, together with a fluid chat squeezed to the limit, caused a slight delay in the programming. 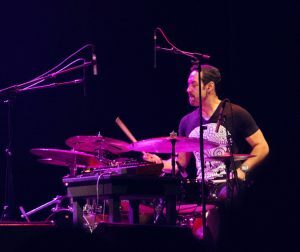 But that slight delay did not disturb the audience at all, it even increased the desire to see him stepping the pedal of the drum. A “dirty” audio recording where you could hear the voices of real people who were stopped by the immigration police (despite being many of them even US citizens in the United States *as Antonio Sánchez explained*), it was a disconcerting and stimulating entrance at the same time. The show began with a long track called “Travesía” and linked with “Long road” and “Home”, where the members of Migration brought out their different skills. Thana Alexa got her vocal effects to dance in harmony with Chase Baird‘s tireless lungs on saxophone. 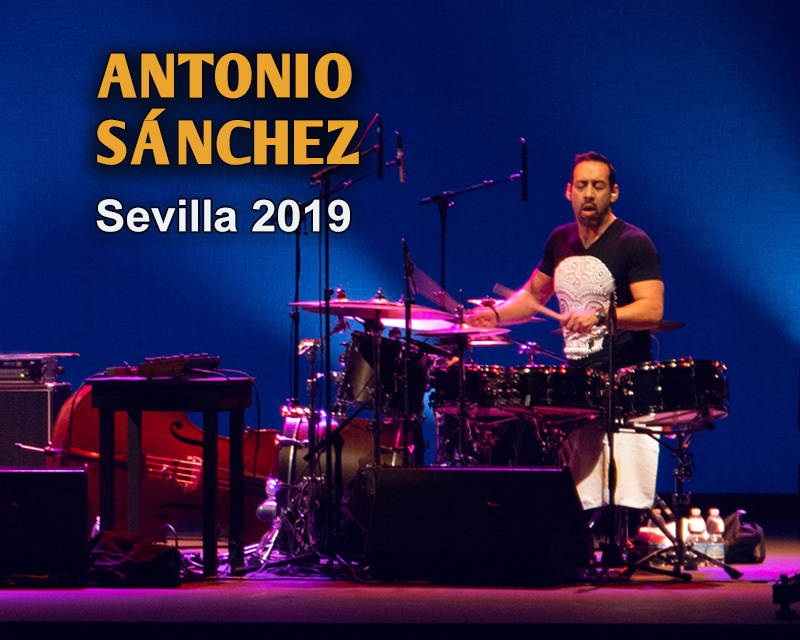 During the concert, and in a brief pause of the performance, Antonio Sánchez explained the origin of the name and the meaning of the album. “Lines in the Sand” has a powerful message of denunciation that relates the migrant’s experience, but not from his own point of view. He recognizes that despite being from Mexico City, and that he had to go to the United States to study and train as a musician, he feels fortunate that he was able to do it thanks to his family and in a normalized way. He focuses on those who suffer the most, those who, for lack of a future, seek refuge from hunger and violence produced by wars or political persecution. I rescue this quote from the movie Birdman because it may summarize with high doses of reality and in essence, the ultimate motive of my lines. 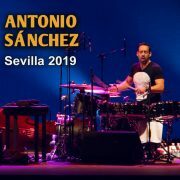 In the current moment we live, where information, music, and entertainment is massively consumed through a mobile, tablet or PC from platforms like YouTube, I do not lie if I confess that before facing the concert of Antonio Sánchez & Migration in Seville, I was looking at different videos of their performances and concerts. And yes, it was a joy to see clips where the Mexican drummer proved to be a virtuoso, but once I looked away from the screen, and got to the Lope de Vega and met reality…I had “a real experience“. Sanchez recognizes that he always wanted to be a rock star, with Ringo Starr or Led Zeppelin among other references. He doesn’t know how he ended up being a jazz musician, “unfortunately”, as he said sarcastically on stage. The jazz that was played that night had influences from innumerable sources. Funky Rhythms, rock of an incessant nerve, or the elongated shadow of Pat Metheny, who was loitering at times in the collective subconscious, and that enriched each theme. 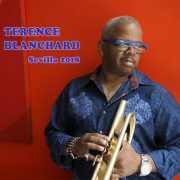 Jazz fusion that reminds the greats like Miles Davis, with that musicality that makes Antonio unique when he sits on the drums, and becomes an octopod of surgical speed and precision. It is pleasing to know that music has the power to provoke emotions and enjoyment without further ado, or at the same time, be a warning call. Antonio Sánchez compiles all the voices of those emigrants or people who want to be helped/listened, in a sonorous travel notebook. Twice the reason to have a “real experience”. Antonio, thank you very much for sharing your time before the concert with SoundTrackFest. 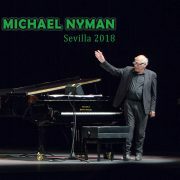 We would like to welcome you to Seville, and to this jazz cycle where composers such as Michel Legrand, Terence Blanchard, and Michael Nyman have performed. All of them, also movie music composers just like you. So I have to ask: What do jazz musicians have to fall in love with the movies or vice versa? Well, it’s an interesting question. I think that what jazz has that can make cinema fall in love and vice versa is that both types of music are very cinematic. They evoke images, they are generally instrumental and it is up to the person who is listening to let them evoke or imagine. Jazz lends itself to cinema and images also lend themselves to jazz, for the same reason. While I was thinking about an infinite number of questions I could ask, I always think about why a musician ends up leaning towards one instrument and not another. And in this case, your case, the drums, and percussion instruments. In my childhood, my parents gave me a drum and this reminded me that drums are usually a very common gift to children. Could it be that this way, you got the passion for music and more specifically for the drums? Jazz is a ‘free music’ that allows you to improvise and has its own language. You have experienced the composition of an album recorded in your studio by improvising 100% at the drums and later adding electronic elements. This way of composing – letting the music flow – is not very common, but do you consider it to be your most pure or personal style? I think that composition is improvisation and improvisation is composition. Whenever I’m improvising I’m thinking about a long curve, I try to think about a long curve, and when I’m composing it is the same. I’m always trying to think about transitions, especially how I’m going to try to get from A to B to C and make it logical and tell a story. For me, the most important thing is improvisation and composition. How are you going to tell the story you want to tell, and the way you tell it, is what is going to make the public feel something. Because you can have three beautiful parts and if you do not know how to connect them, the plot is completely lost. And for me, it is the most important thing. It’s like a movie. Many times the story is there, the performance is there, but without vision everything is lost. Because it just does not look good with the whole story and that for me is very important as an improviser and composer. Let’s move on from a free composition born of improvisation to your works for movies, where music helps to reinforce and goes hand in hand with the images at specific moments. How was that opportunity to be in a film as special as BIRDMAN? Well, Iñarritu saw me playing with Pat Metheny in 2005 and we started a good friendship since then. He remembered a drum solo that I did that day. He told me that I looked like an octopus and he started telling me a lot of things that he liked a lot. And well, there it was. We kept in touch and one day he called me and proposed me the movie. Obviously, I was very happy but within two seconds I got a terrible panic and terror, because how do you make a Hollywood movie only with drums? I knew what he wanted, why he wanted it, and how he wanted it. He knew how to guide me in a very intelligent way. And above all, he let me do what I do, he did not try to mold me in any way that was forced. He simply let me be myself. And that was the most valuable thing for me, and besides, I think that was why the formula worked at the end. He allowed me to improvise, he let me react as I react with a group, but simply, this time I was reacting to the plot, the scenes, and the movements of the actors, but basically, I used my instincts as well, the ones I am going to use tonight at the concert. What codes were used in the joint work with the director Alejandro Iñárritu? What references did he give you or on the contrary he gave you absolute freedom? Of course, he was directing me, but he did it within a framework from where I could be myself in any way. Everything was very spontaneous and improvised. At first, I sent him some demos that were very structured and he did not like them. “What I want is improvisation” is what he told me. “This has organic energy, something of the moment.” Then I said, ok. It will be easier than I thought, because it is what I do best. With BIRDMAN came the Golden Globe nominations, BAFTAs and winning a Grammy, the award at the Ghent Film Music Festival and the Critic’s Choice award for the best composer at the Venice Film Festival. 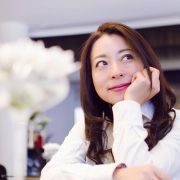 How did you manage so much success? Was there a moment where you felt that you were overloaded? Well, no, because I knew that this is a matter of Hollywood. What I like is playing, composing especially for me and I enjoyed the experience very much. Now I’m doing a lot of television. I’m doing a series called Get Shorty and it’s likely that a new series will start soon, and I like that more, because it’s not as condensed and stressful as with a movie. Also, now we’re going to have the third season of Get Shorty and it’s like having a steady job, which is quite valuable. Nowadays, you can see how many famous Hollywood actors are making series for television, because at the moment television has many more interesting proposals than Hollywood. True. Platforms like Netflix or HBO are giving the opportunity to reach to all parts of the world. Of course! And also with the content that they are creating, they are not constantly thinking like in Hollywood that if they do not sell 200 million dollars of tickets it is a failure. And that makes the formula of the cinema to be lost in the commercial question. That’s why the number of superhero movies we have is suffocating. But the good thing is that the answer is on television and the content created on demand. Besides being of very high quality in productions that match cinema. Exactly. They are like mini-movies in each episode of a television series. Well, we have the case of Alfonso Cuarón, who with Roma, despite being an exclusive Netflix film, has garnered several awards at the Venice Festival and the Golden Globes. Even Spotify is already creating content and that’s obviously the formula now. Looking back… what memories do you have of the struggle with the Academy of Motion Picture Arts and Sciences due to the absence of the OSCAR nomination? Well, it was a bitter moment, of course, that the soundtrack was not considered worthy of participation. But now looking at it from a perspective of four years later, I think the controversy helped a lot. In the sense that people were even more curious: “What is this about the drums in the movie?” Like a strange inertia was created with the soundtrack, and critics and people were interested in it. It was beneficial in the end, because I think I would not have won it anyway, even if I would have been nominated. It would have been like “oh, yes ok. We nominate you because everyone says it’s interesting” but the Academy didn’t want to follow that path, obviously. BIRDMAN LIVE SCORING EVENT has become an essential event for every lover of the film and certainly an opportunity to enjoy an experience that takes the viewer to another level. How much risk do you take in each performance, where the music must be accurate? It is an interesting experience for the audience. It’s a combination of going to see a movie and watching a concert. When you go to see a movie and you do not appreciate anything live, there is no energy exchange. And instead, when you put a person on the stage the equation changes completely, and I feel the energy flowing, and people laugh more generally at the scenes. They come with another mentality, and also what I like the most is that at the end of the film I do a solo of about fifteen or twenty minutes. And many people tell me later that they had never heard a drummer who could do that. The reality is that most people have never heard a drum solo for more than a few seconds. So the reaction of the people is, “wow, I did not know that the drums had so many sounds and so many possibilities”. And obviously I play during the whole movie, but in the end, it’s when I expand and give 100%. It is true that film projections are becoming more and more usual with an orchestra playing the soundtrack live. Harry Potter, The Lord of the Rings or Psycho are some examples. I think that in this type of proposals the film is “alive”. And besides, this is unique. There is no other movie where a drummer is playing the soundtrack and just nobody else. Exactly. And in the United States, I keep doing it quite often. But not everything orbits around BIRDMAN, as you also contributed in the documentary “Politics, Instructions Manual” by of one of our illustrious Spanish directors such as Fernando León de Aranoa. How did this collaboration happen? 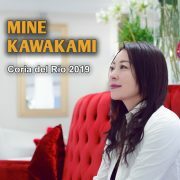 Perhaps, due to the fact that you are a politically committed musician and some compositions have been born to denounce the current situation of the United States and the Trump government? Do you think it was that, what drove you to the project? No. Fernando called me and I really had just finished the Birdman thing and I wanted to do something else, some other movie. And I saw that the project was interesting. I never composed for a documentary and when I saw the subject I liked it. Obviously, there are people who do not like politics very well, as we are going through a strange moment worldwide, politically speaking. But at that time I saw it more as an artistic challenge than a political one. I do not live here in Spain, but thanks to the documentary I learned a lot about what was happening. So it was an interesting experience. In Spain we also have our “political issues” (*laughs*). Everywhere they have things (*laughs*). How would you explain to the audience what they are going to witness tonight at the concert? We are promoting the last production called “Lines in the sand” which is a project dedicated to migrants. Those emigrants who are fleeing because of wars, violence, political persecution, and who are being demonized and politicized lately by very powerful people, in the name of twisted nationalism and populism, which is eroding, according to my point of view, a basic faculty of the human being, which is basically feeling empathy for other human beings. This show is dedicated to them. When listening to the album, the poems, and the lyrics, I want that people simply stop and think about how lucky we are. Most of us do not have to flee our homes for fear of being extorted or for fear of dying from war. Or simply for not having anything to eat. So it is a moment to reflect and also to see how we would like to be treated if we were in that precarious situation. And that is basically what the album is about. And of course at an instrumental level, I think I’ve grown a lot as a composer and that on this album I’ve got my greatest achievement in that sense. I hope that in each new album that I do I will grow even more. 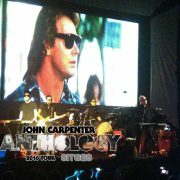 In this disc, I include several quite long, very cinematic pieces, where I have dedicated a lot of time to compose them. There is a lot of improvisation and a lot about telling a story. And that is the most important thing for me.